12 Feb 2012 in aliens book reviews in memory science fiction young adult fiction ~ read. 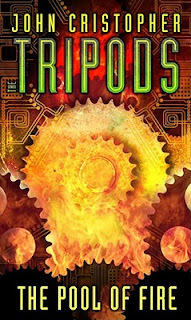 The Pool of Fire is the third book in the Tripods series by John Christopher. I’m reposting my reviews in tribute to this great science fiction writer who died last week. Time is running short, and the final push to overthrow the Tripods has begun. To do his part against the Masters, Will must risk his life and go back inside the city that he hoped never to see again, the city where he was a slave and where he saw so many horrors. This book is a little more fragmented than the others – it’s really several different episodes involving Will and his companions in the battle against the Tripods. But it’s an exciting story, and anyone who enjoyed the first two books will enjoy this one. One of the things that makes Will such a likeable character is that he’s an ordinary boy. He’s not the smartest, or the most disciplined, or even the most heroic, but he still manages to be in the thick of the war, striking blow after blow against the tyrannical rulers of the Earth. Through Will we come to believe that anyone can be a hero.